The market opens at 10AM. Fill your cart with veggie goodness from Grow with the Flow and Heirloom Gardens. We have a great selection of spring crops on the market this week, including arugula, leeks, Napa cabbage, head lettuce, radishes, spinach, and five different varieties of kale. ALERT! ALERT! Spring is finally here— in the form of a STRAWBERRY! Heirloom Gardens is treating us this week with the first of their delicious gems. These will go fast; put them in your cart quickly. We have several new and interesting items in the bakery department. HomeSpun Baking Company is now serving up a gluten-free morning glory bread – with organic carrots, raisins, walnuts, coconut and pineapple. Wow! Not to be outdone, check out My Daily Bread’s Everything Breadsticks and Ciabatta bread. The meat department is also chock full of items this week. Carrell Farms has listed our favorite Alpaca and Water Buffalo products. If you’d like to order an Easter/Passover lamb, contact Bramberi Farm & Gardens through their listing; they will have your order ready for pickup on March 31. 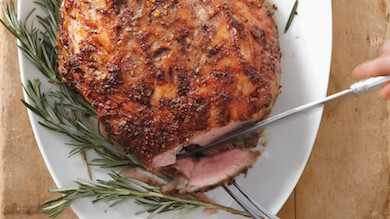 This week, however, Bramberi Farm and Gardens is listing one leg of lamb. And if beef is what you’re looking for, look no further than Southern Grass Meat and Indian Creek Angus. What is the market missing? Are there any products that you would like to see offered by local artisans and farmers? Please email theucmmingharvest@gmail.com to let us know what your food interests and needs are! Pick Up every Saturday from 10am-12pm. Located in a small building directly behind The Episcopal Church of the Holy Spirit. We thank you for your interest and support of our efforts to bring you the healthiest, the freshest and the most delicious locally-produced foods possible!